If you’re like most of the population, you only upgrade your computer every couple of years, if that. I was recently surprised (and, I’ve got to admit, more than a little pleased) to discover that the computer shop closest to home still sold old-style PS/2 style keyboards. Sure, they were only two bucks a pop, which suggests they’re not exactly a high-demand item. Still, USB supplanted PS/2 as a connection methodology more than a decade ago, and their retail presence does suggest that most of us are getting a lot of wear and tear out of our expensive IT purchases. That’s a good thing, both from a value for money and environmental standpoint. One of the benefits that you get when upgrading if you’ve held onto your current computer for any decent length of time is the jump in system and processor speeds that will have happened while you were getting a useful service life out of your old PC. It’s not a new idea, but it’s still true today; when buying new IT equipment it pays to buy at the top of the speed curve relative to your budget. You might not need that new speed today, but it’ll ensure that your purchase remains current for quite a bit longer as the applications of tomorrow are still well suited to the speeds your system can maintain. Conversely, buying as cheap as possible will get you yesterday’s technology, and while you may be able to run things today, you may find some of tomorrow’s applications beyond the grunt of a simple system. It’s a fine balancing act — it’s certainly possible to spend too much on a system with components you won’t use as well. So what’s current and upcoming in the PC world, anyway? On Intel’s schedule for the very near future are its next generation “Ivy Bridge” processors; these feature improved onboard graphics, USB 3.0 support, better power management — and naturally they’re claimed to be faster. AMD’s continuing on its path of “Fusion” processors — systems where the processor has a full DirectX11-compatible graphics processor built in, making them highly competitive with Intel’s processor parts, although in pure market terms Intel’s still the big shark to AMD’s minnow. Looking even further forward into the types of optical chips that high end servers use, IBM’s just revealed a technology it’s calling “Holey Octochips” — and that’s not just a prototype name that somebody drew out of a hat. IBM’s Holey design quite literally takes a chip wafer and blasts forty-eight holes into it so that laser light can pass through it; IBM’s claim is that this gives the eventual chip data processing capabilities of up to one trillion bits per second. Fast, in layman’s terms. 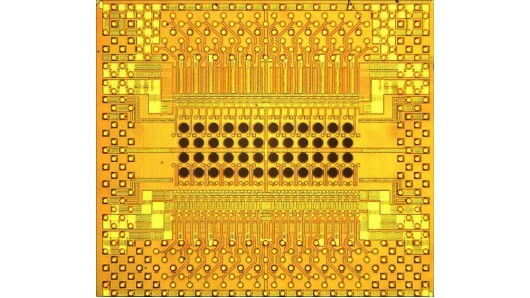 You won’t be using a holey octochip on this or even next year’s PCs — it’s still a product pitched for high-end supercomputing, and IBM’s hoping to licence the design out to other companies — but within the next five to ten years, it’s entirely possible we could all be flinging bits around at speeds that are all but unimaginable right now.